Most of the important Windows user folders are quite easy to access. If you need to view your desktop, Documents, Pictures or Videos, say, they're usually just a click or two away. 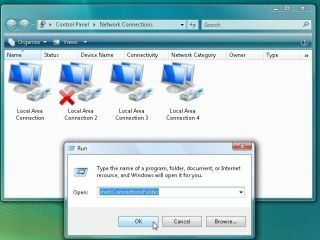 Windows has many more system folders which you might need to access occasionally, though, and they're much harder to find. Would you know exactly where Windows stores your cookies, for instance? Your SendTo shortcuts, desktop themes, saved searches? Spend a while browsing in Explorer and you'll probably find whatever you need, eventually, but there's a much quicker and easier way: the shell command. Click Start (or Start > Run in Windows XP), type shell: and the folder name and you'll see the folder immediately. So entering shell:Cookies will display the cookies folder; shell:SendTo reveals the Send To shortcuts; shell:ResourceDir brings up your themes, and any searches you've saved are just a shell:searches command away. Don't want to type anything? Shell folders can also be used in shortcuts, for easy embedding in the Start menu. Click Next, type Search as the shortcut name and click Finish. Drag the shortcut over the Start button, drop it at the very top of the Start menu, then that's it - you now have a menu entry which will call up the Windows Search tool at a click, whenever you need it. There are plenty of other shell folders available. Windows XP had around 40, this doubled for Vista, rose to over 100 with Windows 7, and Windows 8 adds still more. We've sorted them into bite-sized categories below for easier digestion, but if you insist on having the full, low-level gory details then you'll find them all in the Registry at HKEY_LOCAL_MACHINE\SOFTWARE\Microsoft\Windows\CurrentVersion\explorer\FolderDescriptions, or HKEY_CURRENT_USER\Software\Microsoft\Windows\CurrentVersion\Explorer\Shell Folders for Windows XP. Open the Public ringtones folder. This should contain some sample files - take a look.